The Metropolitan Museum in New York holds in its collections a drawing on paper realized with pen and brown ink by Albrecht Dürer at the age of twenty-one presenting on its recto a self portrait, a study of his hand and a pillow; on the verso six studies of the changing forms of this single object in three vertical pairs. Regarded as one of the greatest early drawings by the German artist, it has been considered as a preparatory study for his self-portrait of the same year, one of the first independent works on that subject in Western tradition. It was arguably realized with a round mirror, revealed by the alteration in the proportion of the nose registering its convexity. On the right side of the head stands the detailed study of a hand, detached from the body and bigger in proportion. On the lower part of the paper, mirroring the position of the head, a pillow. There is something odd, and strange, and seductive in this study whose parts seem to form a deliberate composition, both formally and in its subject. It seems to trace a process, the materialization of a study in a form reflecting its era, as it follows the wandering attention of the artist, who arguably started working on the portrait, then studied his own hand, and then pinned down an object he might have had around then, caught by its form and possibilities of representation, continued on the back sheet. Yet, the spatial relation between the head, the hand and the pillow does not seem casual despite the disproportions between them: the corresponding position of head and the pillow suggests a relationship (and isn’t ultimately the mark left on a pillow a ghostly apparition of the body, the trace of an absence, a portrait in absentia). The hand is frozen in the gesture of holding something between the fingers: is it the thistle of the painting that is taken to be based on this sketch? - or a brush, attribute for excellence in artists’ self-portraits? Seen today, the verso is even more striking, for the pillows are represented as free forms in space, floating in the void, organized as a grid – a premonition of the strongest modernist tropes – a repetition through difference. Whereas it was common to draw draperies (and Dürer himself made several such drawings and sketches) a pillow is not a surface, but an unstable volume, describing a form which is constantly subject to a potential transformation, occupying a space. An object that is manipulated, shaped, and offers itself as a cast of an absent body, or which momentarily seems to suggest a head – a face. Caroline Achaintre’s ceramic and leather creatures – a grey-striped oval, two snake-textured vertical shapes, one in yellowish and one in blue tones, and a rich black rectangular form – are sculptures that take volumetric form by folding and crumpling a sheet of clay, and almost seem to compose a sequence. They appear as variations on a subject, forms holding a position just temporarily, which – in the images that I am looking at – float on the wall of her studio just like Dürer’s drawn pillows on the white page. Similar to them, they suggest through folds and lumps, light and shadows, a face or an image, the wax imprint of a face. While definitively being objects, they refer to the surface, the space of painting. Caroline Achaintre’s work is always manifesting a state of suspension between two possibilities: playing with and undermining the medium specificity of both sculpture and painting, addressing figuration and abstraction, being at the same time seductive and violent, soft and hard. Whether employing ceramic, watercolour or textile, forms always appear to be impermanent and figuration is just temporarily there and always at risk of dissolution. In her last series figuration seems to have almost dissolved and to give in to their disposition to become shapeless: faces seem to emerge from the watery colours of her paintings on paper, or in the folds of the ceramic shapes; but as we grasp a figure, it explodes into an abstract composition, and matter condenses into an apparition. Our sight has to constantly adjust. Her tufted pieces - soft sculptures or three-dimensional paintings that often combine modernist patterns with figurative imagery stemming from pop culture and ‘80s myths – are here replaced by small textile collages, which feel closer to the watercolours and the sculptures in terms of size, intention and immediacy. Performance has recently been addressed as a language in her practice and, while a performative attitude has always been an element of her oeuvre, it emerges more strongly as a specific quality in this new body of work. 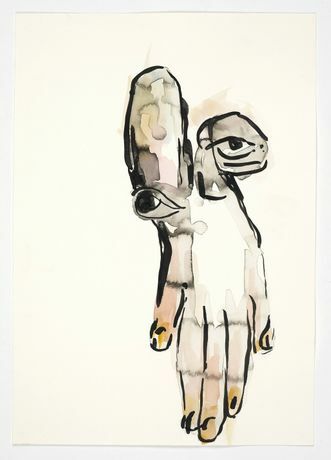 Among the drawings, the one that lends its title to the exhibition has different stylistic qualities from the other works on paper: it shows an upside-down hand, on which two eyes are superimposed and a curve at the height of the wrist seems to suggest a shoulder. It is a striking piece, both evoking her previous series of masks and mask-like tufted wall sculptures, and eerily the recto of the drawing by Dürer. Georges Didi-Hubermann calls such encounters between images that belong to different times anachronism: the intrusion of a chronological line into another. In his view, such projections allow the work of art to inhabit a plurality of periods; this ultimately illuminates both such images which – unaware of each other and unintentionally – call to each other. In spite of its style, Dürer’s small study is an early declaration of self-awareness. His gaze and hand extend the previously unvaried observation and representation of subjects and objects. Limbo seems to share the same elements of the German master’s practice: the hand, the eye. To see, to exist, and in such unexpected proximity, makes us wonder if the nature of the works on show - in their suspended state between painting and sculpture, figuration and abstraction - could be self portraits rather than masks. Caroline Achaintre (UK, 1969) Recent solo exhibitions include those at Tate Britain, London and Castello di Rivoli, Turin (2014-15), whilst her ceramic and textile works are currently part of the touring British Art Show 8 (until 2017). Her forthcoming solo exhibition at the BALTIC Centre for Contemprary Art, Gateshead opens this summer. She lives and works in London.